We’re poring over the results of new research conducted by the National Partnership for Women & Families on election eve and election night that took the pulse of voters on issues related to paid leave. Voters of all partisan affiliations agree that it is important for the next president and Congress to consider paid sick days and paid family and medical leave laws. Virtually all Democrats and most independents (84 percent) and Republicans (70 percent) say it is important for paid sick days and paid family and medical leave laws to be considered. Voters’ support for a national paid family and medical leave fund is broad and intense. More than three-quarters of voters (78 percent) say they would favor establishing a national law that would create a fund that offers all workers 12 weeks of family and medical leave with some pay when they need to care for a new baby or adopted child, have a serious illness or need to care for a seriously ill family member. Just 16 percent of voters say they would oppose such a law. 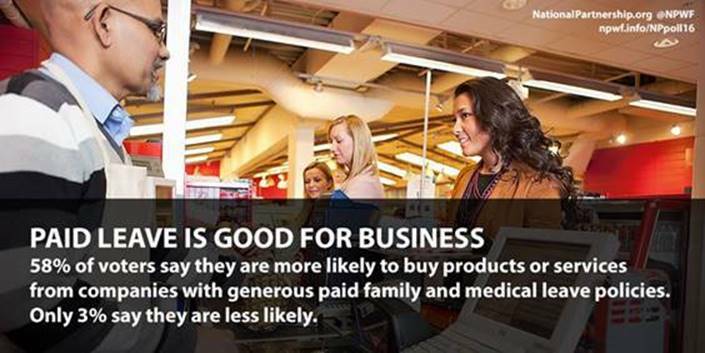 Businesses could benefit from having – and publicly announcing – paid family and medical leave policies. Nearly six in 10 voters (58 percent) say they would be more likely to spend money at a company that offers a product or service they need if they knew that company offered a generous paid family and medical leave benefit to their employees; four in 10 (41 percent) say they would be “much more” likely to spend money at that company. Just one-third (36 percent) say a company’s policy would make no difference. This is compelling evidence that confirms what we see everyday — public opinion on parental leave has shifted in the last few years, and politicians of every stripe and businesses of all kinds benefit by exploring and expanding the ways they can lead on leave, such as by supporting the FAMILY Act. This legislation covers all types of family leave and would be affordable for families and businesses alike. You can review all of the key survey findings here. To learn more about how we can help your company with parental leave policy and practice, visit our services page or get in touch.